Father's Day, 2014, is in the books. I'm thinking most fathers take their special day a little bit for granted. For years now you've been getting socks and tools and manly do-dads (see what I did there? do-dads?) on the third Sunday in June. What started as cute, whimsical, homemade cards from your precious daughter and strapping son have evolved into store bought greeting cards and the occasional phone call. Am I right? I hope not. I didn't know my biological father very well. I didn't really even meet him until I was about 19 years old. My step-dad was the man who actually raised me. While I never called him "Dad," he was one. He was the one who taught me to drive in a 1950 Ford truck he called Gertrude. He's the one who took me camping although he referred to it as "deer hunting." (We never shot a deer. Never. Not once. It was camping.) He's the one who bought me my first bike, first 10-speed, mini-bike, motorcycle. He taught me how to work on cars and let me hang out with him at the gas station (his night job after his day at "the plant"). He also gave me my first drink of beer and first shot of whiskey. He was my Dad. Even after the divorce (my mother's third), he remained my reference dad. I thought everyone had that kind of dad. When I finally met my "real" father, I was struck at the differences between them. The differences between the two men grew as I got to know my father a little better. My "father" was a middle management businessman. He wore ties and wing-tips. He was polite and gentlemanly. Navy man. He was exceedingly well-organized. He drank cocktails -- in moderation. I respected him, but never really felt any real emotion like love. I just didn't know him well enough. My "dad" was a blue collar laborer. He wore work shirts and steel-toe boots. He was blunt and rough around the edges. Army man. He usually left his socks in the living room. He drank beer -- quite often. I loved him in spite of his faults, his gruffness and the way he treated my mom in the waning years of their marriage. Needless to say, I didn't have a common childhood. Normal? Yes. At least I thought it was. Common? Probably not. Don't get me wrong, I know there are millions of other sons and daughters that were latch-key kids, or children of divorce, or were raised by one parent, or had many step-this and half-that relatives. So, I know I'm not special in that regard. In fact, that idea of a Typical American Family probably doesn't exist anymore. My wife's parents were married for 47 years and had eight children. Uhm, yeah, that wasn't us. Here's the funny thing: I am sure we must have celebrated Father's Day. I'm confident my mother would have made sure of it. I just don't remember doing it. Since they are both no longer with us (my father passed away just last year in his 80s, my dad in 2000 at 65), this bothers me. As a kid, my dad must have gotten his share of socks or beer mugs or accessories for his truck. As an adult, I'm pretty sure I was conscientious enough to send something to both dad and father wishing them the typical Hallmark Card sentiments. I just don't remember. As big an influence each had on my life (in their own way) I don't remember any Father's Days. I guess that kinda makes me a bad son. To both of them. Until recently, dads and fathers have always been an awkward subject for me. Obviously. My mom has been married four times, so it's complicated. My little brother's dad was my step-dad who raised me and there was my father who I met later in my life. My oldest brother and sister had a different dad entirely, but MY father raised them so he's their dad.... see what I mean? Complicated. As an adult, my perception of fathers has been more informed by literature or film than by life experience. Bob Cratchit, George Bailey, Clark Griswold. 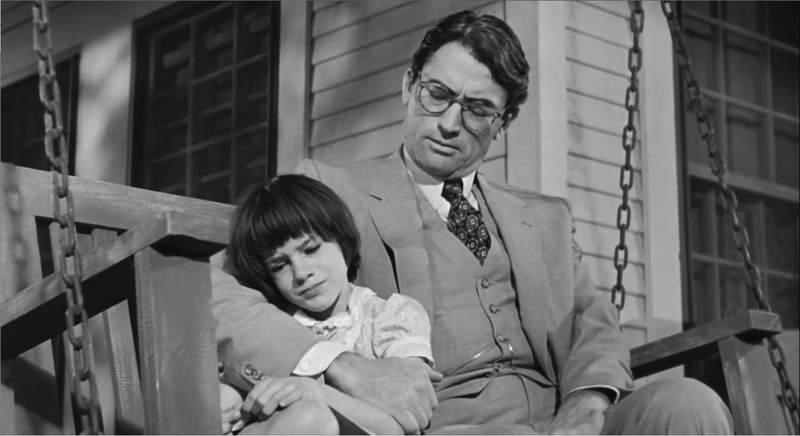 Gregory Peck's portrayal of Atticus Finch in "To Kill a Mockingbird"is my all-time favorite movie dad. Not only is Peck's performance flawless, but so is the character. Of course, he stands for all things good and just as an attorney. We wish all of our lawyers were Atticus Finch. As a man he is handsome, respected, honorable. We wish all our neighbors were Atticus Finch. But more importantly, he represents the ideal father -- understanding, loving, wise, fair, smart -- but with a couple secrets in his background that, once uncovered, raises him to near superhero status in the eyes of his children. This year I have been the recipient of a remarkable gift -- my first Father's Day. Replete with card and wrapped box. Inside both were perhaps the most perfect gifts that could possibly be given to me by my daughter on this particular Father's Day. With humor and heart she skillfully crafted for me a Father's Day like no other. So moving, so profound, so...perfect. In reference to said box, the post script on the card said, "no dad can live without one of these from his daughter." Yeah, I get it now. I'll never take Father's Day for granted again. I hope you don't either. Oh, and I know it's just coincidence, but my spectacles are very much like those worn by Atticus Finch. Daily reminder in the mirror that I now have something, someone, to live up to. 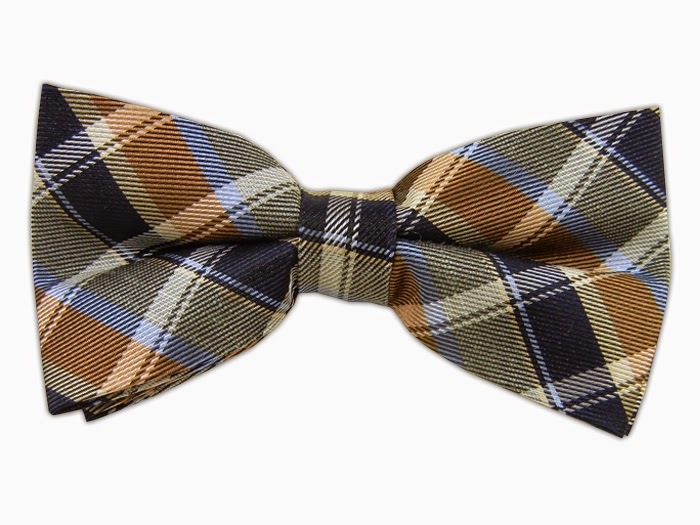 Now, if you'll excuse me, I have to go put on my new tie.